A daytime establishing shot of the FBI Building in Washington, D.C.
A daytime establishing shot of Boston's Flatiron Building on Arlington Street. 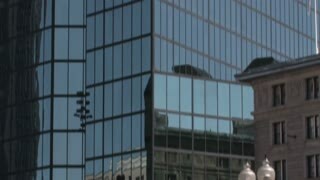 A low angle establishing shot of the John Hancock Building in Boston. A daytime summer establishing shot of the Boston skyline as seen from Boston Common. A Gay Pride Flag is displayed on the John Hancock Building. The John Hancock building in Boston displaying a large rainbow gay pride flag for pride month in June of 2016. 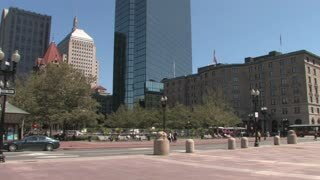 A daytime establishing shot of the corner of Stuart Street in downtown Boston. A large rainbow flag displayed on the John Hancock Building for Gay Pride Month.